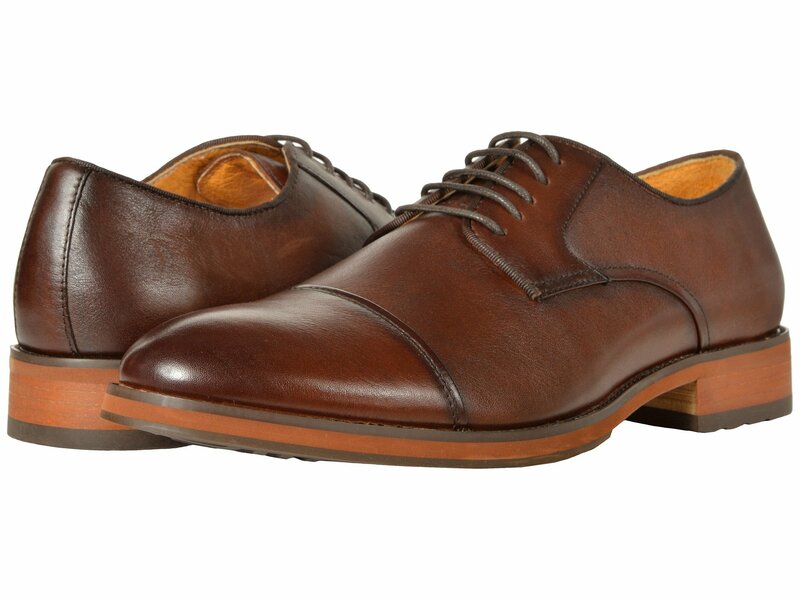 Brown dress shoes in quality leather are a versatile and stylish essential in any man’s wardrobe. But there are so many options. How can you find a pair that you love, looks great, and fits your budget? Not all dress shoes are created equal. Just because they’re leather (or resemble leather), doesn’t mean you’re buying the right shoe… or that it’s going to fit the rest of your getup. Add to that the massive array of options. I dare you to search for “brown leather dress shoes” and not come away overwhelmed. So many brands, colors, styles, and prices… how can you be sure you’re getting a pair that deserves a place in your Lean Wardrobe? No worries. 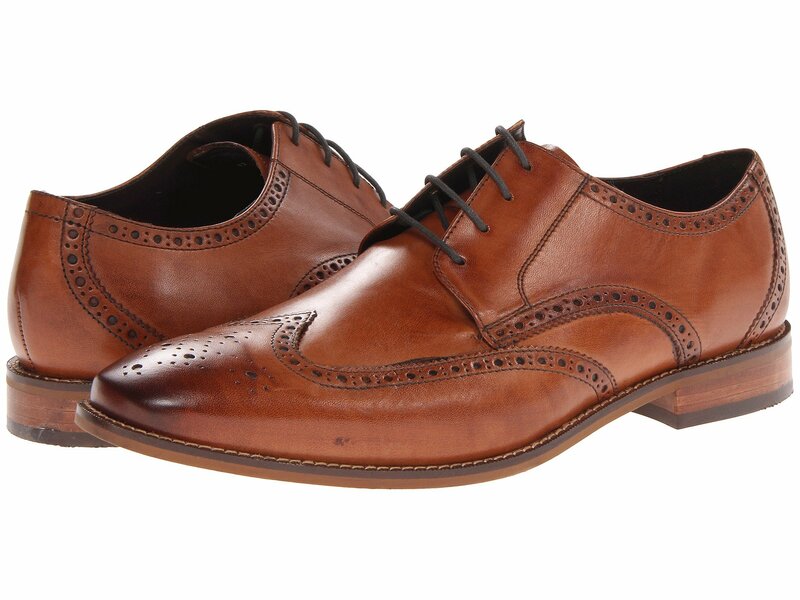 I’m going to help you find and buy the perfect pair of brown leather dress shoes. Once you understand your options and know what you’re looking for, everything becomes much easier. Is brown leather better than black leather shoes? Yes. If you ask me, 99% of the time, I wear some type of brown leather shoe. Why? Brown is richer, more interesting, and more versatile. Brown dress shoes can easily be dressed up and down. Brown shoes go with just about any suiting color you might wear. Sure, black dress shoes have their place in your wardrobe. But if you’re only going to have one killer pair of dress shoes, they should be brown. And if you wear leather dress shoes daily for work, I’d recommend you get more than one pair in brown. Now that I’ve got you convinced, let’s move on to picking out the right pair. Here’s what we’ll be covering in this guide to brown dress shoes. By the end you’ll be a shoe expert and have found the perfect pair of brown dress shoes for your style. 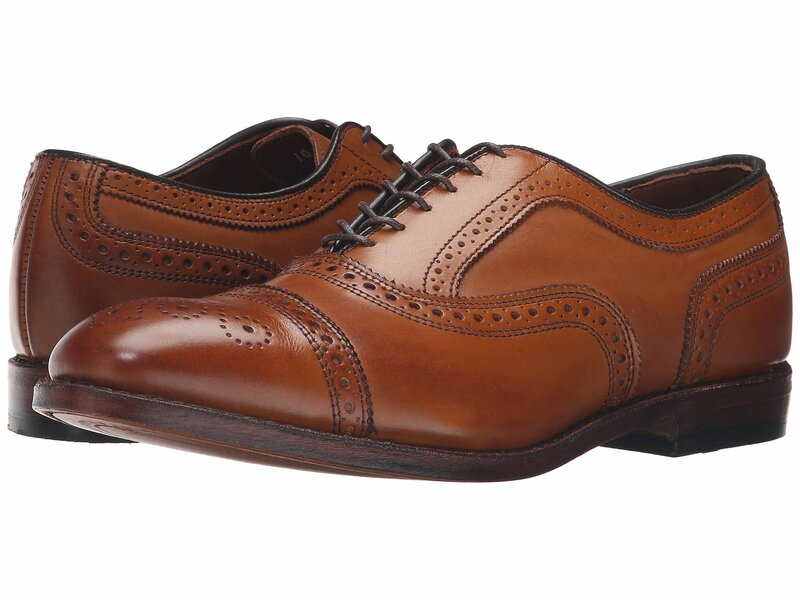 Hit the shoe store – online or local – and you’re going to find an enormous number of brown dress shoe options. All kinds of shapes and styles, shades and tones, curves and soles. Style – Go with a classic style and you’ll never have to replace your shoes. They’ll always be current and will easily match with your trendier items. Formality – Semi-formal shoes are most versatile. They fit in a formal outfit but can also be dressed down into a smart casual style. As we go through some common dress shoe designs, keep in mind these two factors. Don’t get distracted by shoes with great style but a formality that won’t work for your needs. Let’s compare two of the most common styles of dress shoes: oxfords and bluchers. The main difference between the oxford (a.k.a. balmoral) and the blucher (a.k.a. derby or buck) is how the vamp is stitched. With oxfords, the eyelets are stitched underneath the vamp. This creates a more formal look. Bluchers have eyelets stitched on top of the vamp and are considered slightly less formal. The other major factor that determines the formality of your dress shoes is toe design. 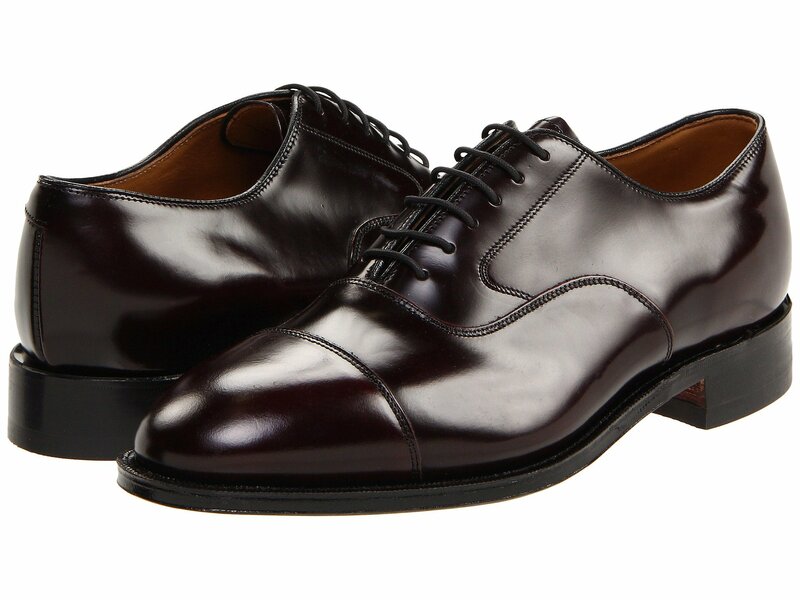 A plain toe (like in the oxford above) is more formal than a cap toe (the blucher above). Less formal still are any shoes with broguing – the decorative patterns of holes on some dress shoes. Originally these were made for aeration when your shoes got wet, but now it’s just for looks. Ultra formal event? Plain toe oxford is your only choice. Casual Friday? Bust out the full brogue (or semi, or quarter, whichever you prefer). Now that you’ve chosen the right style, let’s dive into all your color options. Wondering which shade of brown is best? To be honest, it’s a matter of preference. But it also can depend on what best matches the rest of your outfit. Keep in mind that there isn’t one absolute, best color for your shoes (or anything else in life). And one brand’s take on “brown” may be slightly darker or lighter than another’s. Instead of focusing so much on the specific color of each shoe you consider, think of which shade group it belongs to. For brown, there are three main groups: light brown, standard brown, and burgundy. Above is one of my personal favorites, the Allen Edmonds Strand in Walnut Calf. I love it because it goes great with nearly everything – dark denim, charcoal suiting trousers, olive chinos… you get the idea. All light browns look similar to this, though they can vary slightly. No worries though – it’s hard to go wrong with such an eye-catching shade. Darken things up a bit and you’ve got standard brown leather. This is the Allen Edmonds Park Avenue in Brown Burnished. Notice how there’s a little dark brown or black in this pair, especially at the toe? 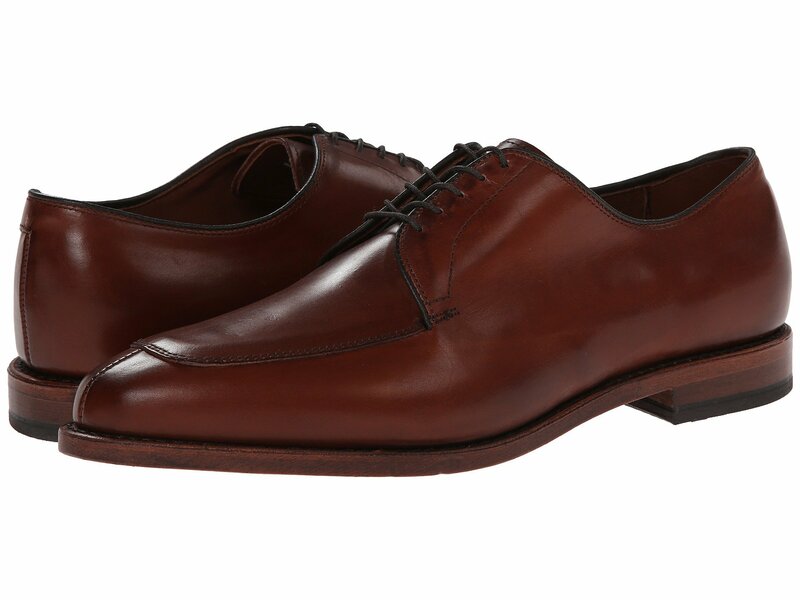 Burnished leather gives the shoes an antiqued, buffed, worn-in look with darker shades of brown at the heel and toe. The darker tones add a bit of dimension to the overall shoe color. It’s a subtle thing – but at EG we’re all about the little details, and I like this one. Even in the world of formal brown dress shoes, you can still find little flourishes of detail that make your shoes stand out. Burgundy-colored leather looks similar to dark brown, but with hints of red. These colors can vary depending on how the light hits them, making these shades some of the richest and most interesting. This is the Allen Edmonds Delray in Chili. Burgundy (also known as chili or Bordeaux) shoes offer a nice alternative to standard brown leather. But depending on how picky you are, it may be challenging to match these shades to your pants. Charcoal trousers, dark navy trousers, or muted khaki chinos (not too light) all look great with this color shoe. Bottom line: Any shade of brown will be versatile enough to work with your wardrobe. Darker shades are more formal while more light and burgundy browns create an eye-catching effect. We’ve discussed style and color. Those are factors most guys consider – it’s hard not to since it’s what you immediately notice about a pair of shoes. Now it’s time to address the shoe’s construction and materials. These are the details you don’t always see, but will definitely notice after years of wear. Make sure you know enough about the materials and construction of dress shoes to make an informed purchase. Otherwise, you’ll waste money and wind up disappointed. Consider the leather uppers used, the construction of the shoe, and the materials used in the sole. There are several grades of leather – from top quality to junk. When shopping for shoes, you want to make sure you’re closer to the top than the bottom. Here’s a visual of the difference between types of leather and what the names of common leather grades actually mean. Shell Cordovan Leather – Made from one specific part of horsehide and produced by just a few manufacturers around the world, shell cordovan leather is expensive and in high demand. Its patina is unmatched and, while you’ll pay a premium for it, you’ll have a pair of luxury dress shoes that will stand out every time you wear them. Full Grain Leather – Full grain leather is top quality. It comes from smooth, untarnished hides that do not have to be sanded down. As it ages, it takes on a rich patina that makes your shoes look even better. Top Grain Leather – A bit thinner and easier to work with, top grain leather has a split layer. Any minor imperfections in the hide have been sanded away and the finish leaves it feeling smooth. Corrected Grain (or Genuine) Leather – The low-quality alternative. It’s still leather, sure. But it’s made from blemished hides that get sanded down and treated with chemicals. It’s then given an artificial grain and stained or dyed to make it look more like a full or top grain leather. Want a pair of shoes that will last you a lifetime? Full grain leather is the right choice. It’s more porous than top grain leather, so it better absorbs polish and develops a richer patina. The result is a classic, stylish pair of dress shoes that will always impress. On a budget? Tempted to go with corrected grain or genuine leather? Resist the urge. The chemical finish and low quality material means it’s more likely to crease and crack. You’ll spend more on repeatedly replacing cheap shoes than you would investing in one pair of full grain leather dress shoes. But even the best quality leather is no good if the shoe itself isn’t built for comfort and longevity. That’s why the shoe’s construction matters too. There are three common types of shoe construction – Goodyear welting, Blake stitching, and cementing. Each is a different approach to how the leather upper is attached to the sole. Which you choose affects the appearance and durability of your dress shoes. Goodyear Welting – A leather welt (or strip) is used to stitch together the upper and the outsole. This makes it easy to resole the shoes without damaging them. The insole and outsole are separated by a layer of cork which conforms to your foot over time. Blake Stitching – The upper is stitched directly to the insole and outsole of the shoe. The look is smooth and streamlined since no leather welt separates the shoe’s components. However, this makes it easier for water to get into the shoe and complicates the resoling process. Cementing – A cheap, inferior way to make shoes. The cement dries up with time and the shoe’s upper separates from the sole. This method is best used on casual shoes that are not designed to last more than a few years. Note that some cemented dress shoes have decorative stitching to make it seem like a different method was used – don’t be fooled. To make sure the stitching is authentic, check that the bottom and top stitches align. Both Goodyear welting and Blake stitching have their respective benefits. And both are sturdy methods of construction. Either one will make for a beautiful, long lasting pair of dress shoes that can be re-crafted when necessary. The sole of your shoe doesn’t get as much visual attention as the leather upper. But it shouldn’t be overlooked. A quality sole makes every step you take in your dress shoes better. These are the most common types of soles used in dress shoes, their differences, and how to choose the right kind for your footwear. Leather – Lowest profile, least weather-resistant. Sleek, handsome, and elegant with a good feel and sound. If you want a classic pair of dress shoes, this is your choice. Dainite – Dainite soles have a lower profile and more polished look than you get from typical rubber soles. They’re a good compromise if you’re going to do a lot of walking around the city in your dress shoes but still need a formal look. Rubber – Grippy and rugged, yes. Dressy and formal… not so much. 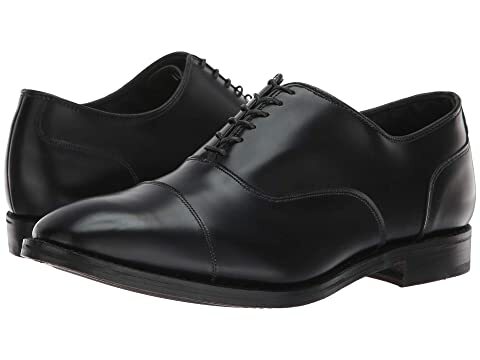 Rubber soled dress shoes tend to be thick and protruding – they’re best for shoes designed to withstand the weather and grip any kind of terrain. 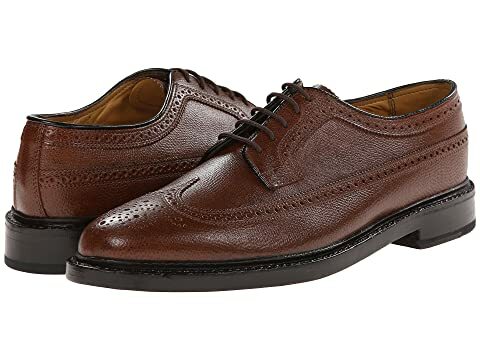 Again, go with the best if you want a quality pair of brown dress shoes that will last for a decade (or more). Leather soles are by far the most professional, formal, and classic option for dress shoes. Avoid rubber – it just doesn’t fit in with a handsome shoe. At this point you’ve learned all the pertinent details about dress shoes. Now it’s time to choose the right pair for you – the shoes that will take your professional outfit from dull to dapper. This buying guide is based on all the factors above – the style, construction, and quality that make a pair of brown dress shoes worth your money and worth wearing for years to come. Think of this guide as a jumping-off point to help you find the right pair. Check out my suggestions to figure out what appeals to you. My hope is that these options help you narrow down your preferences and choose a pair of shoes that work for your style. 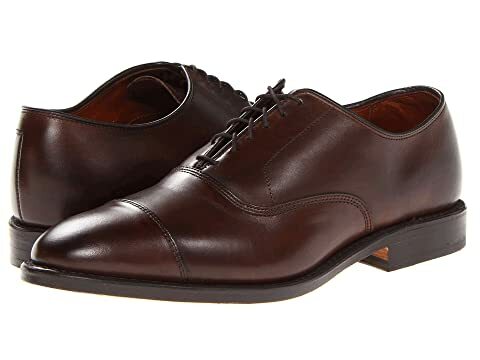 If you want long-lasting, quality dress shoes from a reputable brand, expect to spend at least $300 (full price retail). There’s a reason a good shoe costs this much: the quality of the material and the quality of the construction. You’ll have to replace cheap shoes more frequently because they fall apart. If you’re going to fork out $100 for a pair of cheap dress shoes, hold out for a bit longer and save up an extra $200 to get a better pair. Cheap leather dress shoes don’t age gracefully and look terrible over time. But quality, full-grain leather dress shoes look better as they age and develop a unique patina. Here’s more info on building a patina over time. 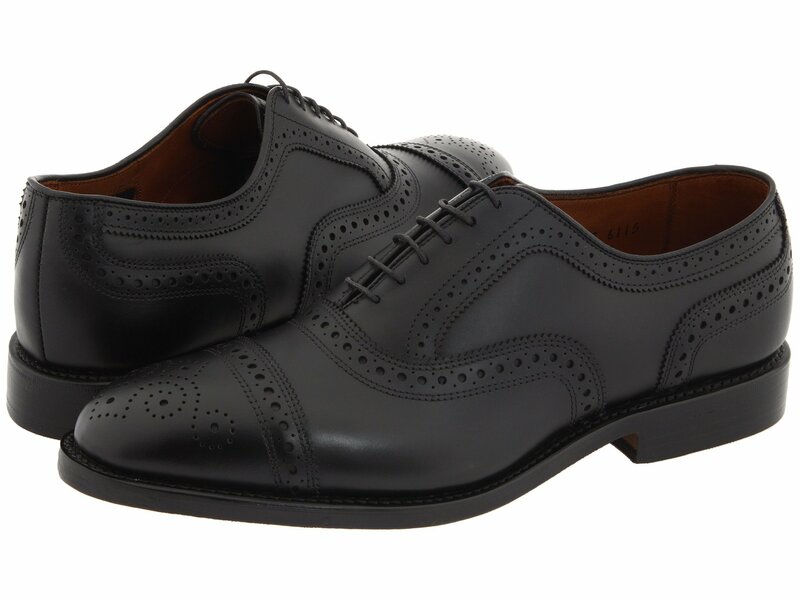 Average the cost over the total days you will use this new pair of dress shoes. You’ll find that spending $300 isn’t outlandish, especially since you’ll be able to use these shoes for years, maybe even decades. But let’s suppose you do have to replace them. A quality pair can be repaired, resoled, and refinished… all for less than buying a new pair of shoes. Bottom Line: Save money in the long term and get an impressive pair of shoes – by expanding your budget beyond the bargain bin. If you want one great pair of dress shoes, my top recommendation is Allen Edmonds. I’ve been a fan for a long time – you can’t go wrong. Some of the more cheaply-priced dress shoes listed aren’t of the highest quality. What if you simply cannot afford a great pair at this time? Find something that looks good with classic styling and take care of them as much as you can. Remember: Your wardrobe is an investment. Go classic. And when possible, buy good quality once and wear forever. Don’t let your shoes go to waste after all the hard work you put into choosing the right pair. You need to take care of your leather shoes. Fortunately, this part is easy. A few small purchases and good habits will ensure your dress shoes always look great. 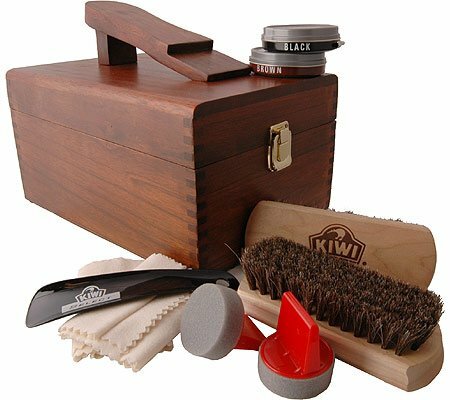 While not in use, your brown dress shoes should be kept flat on their soles, with cedar shoe trees inserted. Do not just throw your beautiful new shoes in the closet. Ever. 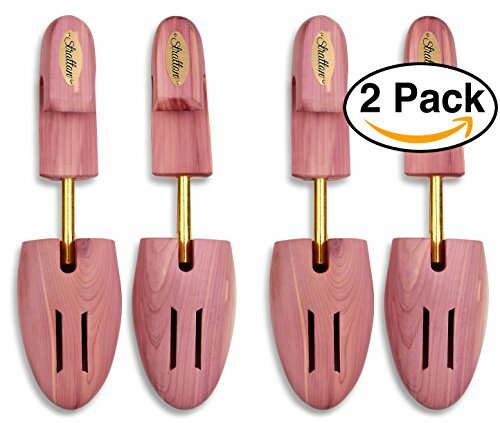 Shoe trees are molds of the general form of a foot that help maintain your shoe’s shape. They come in different materials, but cedar is the only one you should consider – it’s great at absorbing moisture and keeping moths away. Before you buy, remember that shoe trees are not one-size-fits-all. If you buy them too large or too wide, they can stretch and damage your shoe’s leather. If they’re too small or narrow, they won’t provide the necessary support and you’ll risk the shoe losing its form. Polish your dress shoes about once a week (depending on use) to maintain the leather and keep them in top form. If you wear these shoes daily, go over them for a few minutes with a soft cloth to keep them looking smart between polishes. Lift away any dirt or dried mud with a semi-coarse brush. Select and apply the proper color polish (brown or neutral, depending on the shade of your shoes). Work the polish into the leather with a softer brush. Finish by going over each shoe with a soft cloth. Even shoe trees and regular polishing won’t save your shoes if you never give them a day off. Rotating your shoes lets them dry out and ensures they last longer. Even if you only switch between two pairs of shoes, you can potentially double the lifetime of each. You’ve got a killer pair of brown dress shoes that you’re taking great care of. But what should you wear them with to look your best? Good news: brown dress shoes are extremely versatile. They go with just about everything. Here are some examples for both formal and smart casual attire, and more proof that brown shoes are more adaptable than black. Gray/Charcoal – Brown warms up the palette. Dark, rich browns look best. Navy/Blue – Any shade of brown contrasts beautifully with a navy suit. Lighter tones – tan, cognac, walnut, etc. – stand out well against darker navy but also work with lighter blues. Tan/Khaki – Any shade will work. For a dressier look, choose shoes one tone darker than your suit. Black – Here’s one of the few cases where brown won’t work. Yes, some guys will try to pull off brown shoes with a black suit. But in general, it’s a bad idea. These color combinations are just a place to start – not hard and fast rules. In theory, either brown or black shoes can go with any pant color. But what looks best also depends on what shirt you’re wearing (also: what type of shoe, what type of pants, how cool you are, etc.). If you typically play it safe (i.e. black lace-ups with dark denim and a black button-up), try out your pair of brown wingtips with a lavender shirt. Swap out that black button up for a dark red / white bengal stripe shirt. Swap the dark denim for an olive gingham. Lots of options pair nicely with brown shoes – you owe it to yourself to try them out. A shoe’s style, color, and broguing all affect how formal they are and what outfits they’ll look best with. Full grain leather uppers, leather soles, and Goodyear welting or Blake stitching make for a pair of classic dress shoes that will last for years to come. Care for your shoes – rotate them out every other day or so, store them with shoe trees, and polish them once each week. Brown dress shoes go with everything from suits to smart casual attire. If you’re feeling unsure about what to wear them with, match the formality of your shoes to that of your outfit and surroundings. I hope this guide has helped you find the right pair of brown leather dress shoes. Make sure they’re quality and always take good care of them. That way you’ll be satisfied with your purchase and can enjoy investment-worthy shoes for years to come. 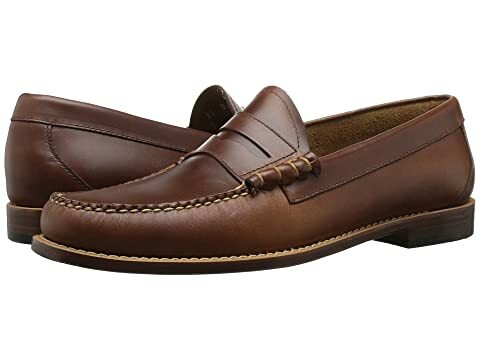 What are your best tips for choosing brown dress shoes? How about your favorite styles or outfit combinations? Let us know in the comments.